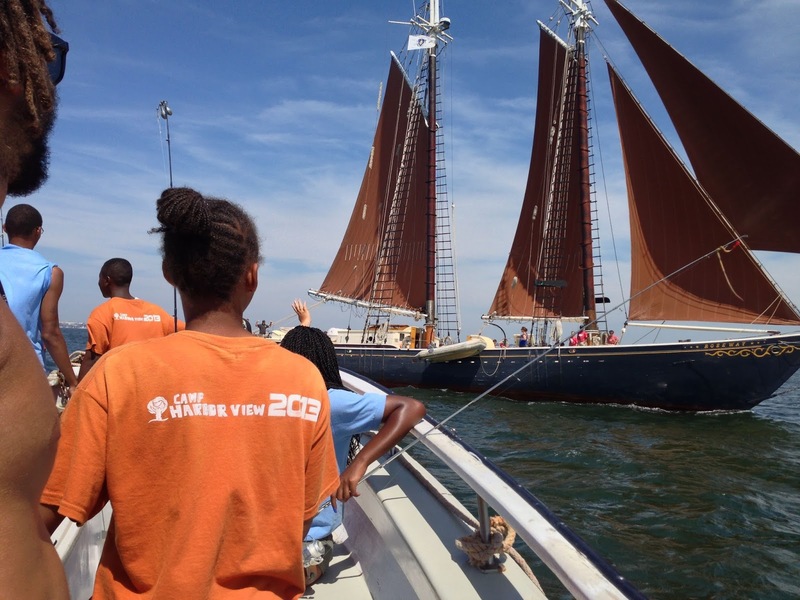 Save the Harbor staff and CHV campers that were in fishing club went out on Boston Harbor to go fishing. The kids were very excited at the start of the day because they were eager to catch some fish. For the past two weeks at Camp Harborview we haven't caught any fish off the dock at Long Island. The kids were becoming a bit skeptical about there being any fish in the harbor. Today, they were able to fish off of a boat named The Belle. The Captain and crew of the Belle are Captain Charlie, Johnnie, Christian. The three of them have been fishing for a long time and the definitely know the harbor and where the best spots are. Save the Harbor's own Bruce Berman was also on the boat and he very experienced when it comes to Boston Harbor and fishing. I could tell we were off to a great start and a promising day to catch fish. At the start of the day we were trying to catch a big bass since we caught a few at last summer's fishing trip. As soon as we came to a stop on the boat at a pretty good spot in the harbor; the kids immediately began to fish. We had plenty of bait including squid, sea worms and clams. All of this bait in the water at once should attract fish pretty quick. After a little while we were having no luck catching a bass so we decided to go to a better spot where more fish were. Captain Charlie took us to a spot where there were tons of fish that have recently come in to harbor. We arrive at a spot between castle island and spectacle island and began fishing as soon as we could once again. We had very good technology on our side that was letting us know that there was fish around where we stopped. Within fifteen minutes our first fish was caught. The kids were very excited and it made them more eager to catch a fish on their own. 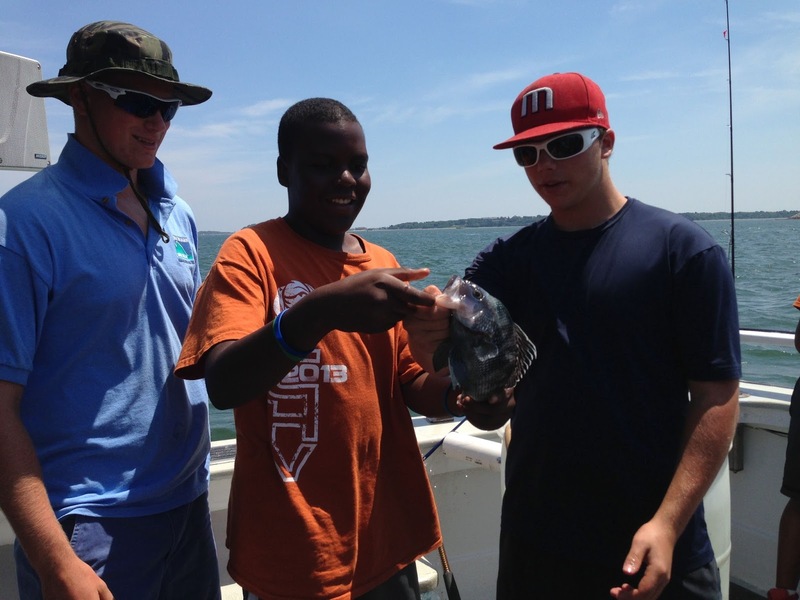 One of the campers had caught a Black Sea Bass and in my opinion it's a cool looking fish. Black Sea Bass were not in the harbor a few years ago, but as of now it seems as though there are tons of them coming in. As the day went on we caught more Black Sea Bass and the kids continued to enjoy fishing on the harbor. Even though it was a hot day the kids still wanted fish and learn more about what they were catching and what kind of bait they were using. 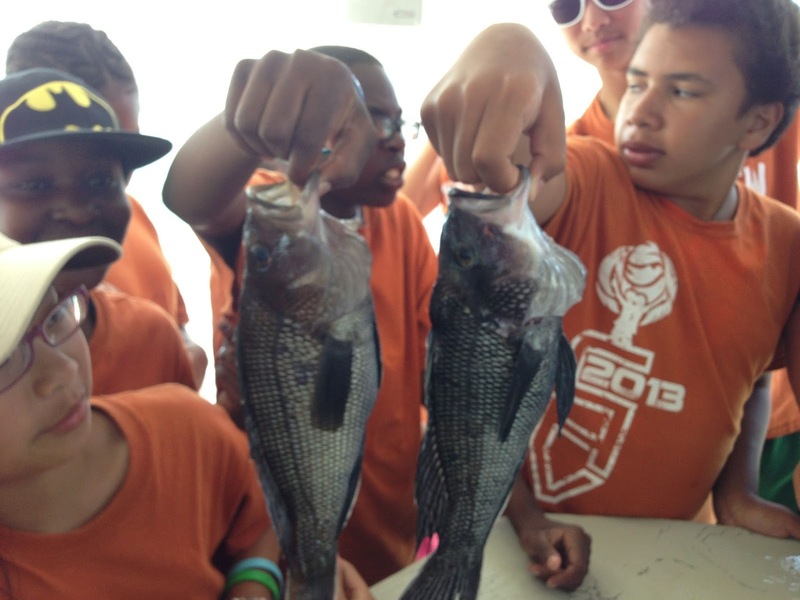 At one point in the day the CHV campers caught two fish within 5 minutes after stopping at a different spot on the harbor. 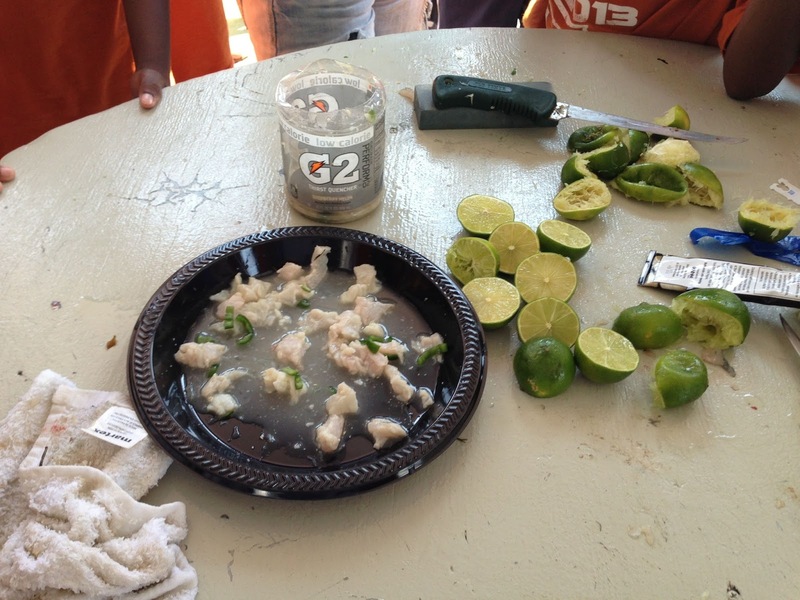 The kids were also able to enjoy some of the Black Sea Bass when Bruce made a ceviche out of it with lime, garlic and peppers. 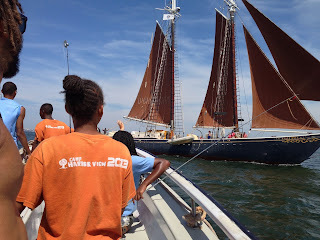 It was an amazing day for the kids and one that they enjoyed. Im definitely looking forward to next fishing trip.